A set of Water Line Hose Pipes,2 Adapters Change to 1/2" Available. Sleek Design---Tulip kitchen faucet design make your kitchen room simple and fresh,easy to match most sink. Multifunctional Outlet Water Effect---3 way spray setting(STREAM,SPRAY,PAUSE),stream for filling water, spray for rinsing, pause for avoiding splashing in multitask mode. 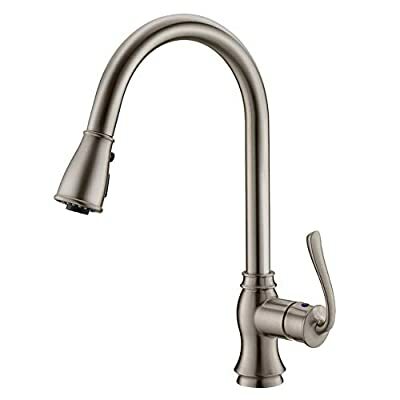 Easy to Install---Pull down hose and water Line hose altogether preinstalled in kitchen faucet to save much time under the sink,no require plumber,finish DIY installation less than 30 minutes.